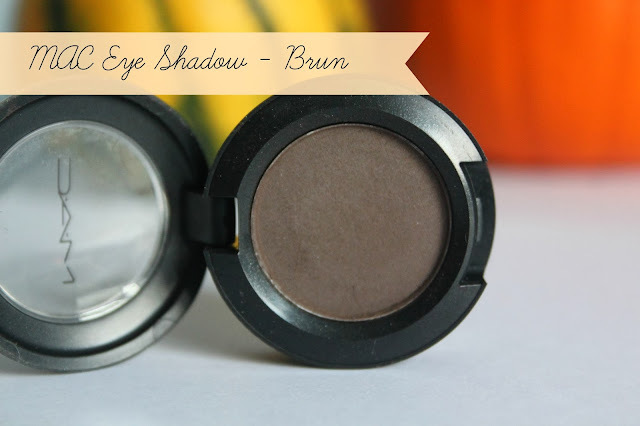 Catarina's Little Space: MAC Eye Shadow Brun(Satin) - Review and Swatch! MAC Eye Shadow Brun(Satin) - Review and Swatch! Brun oh brun, where do I begin? I can't live without it. This MAC eye shadow is such a pretty versatile color I recommend to everyone! I bought this shade a while ago. I even mentioned in one of my beauty hauls (here is the link if you want to have a look). I was looking for a color without shimmer I could use on my brows and this is perfect for me as I have dark brown nearly black hair. The color is a dark cool toned ashy brown. It's not the typical dark brown shade but like a said really versatile. The consistency is pretty smooth and with its satin texture it also blends well with other colors. Like I said it's a very versatile color. I mainly use it to fill in my dark eyebrows but also to deepen my crease, as a lid color, all over my lid( for a brown smokey eye) and as well as a liner. I would recommend to build up the color as I think it gets a better effect. The color looks exactly like in the pan so you won't have unpleasant surprise! Like every other MAC eye shadow it will stay on all day with an eye primer underneath. If you are looking for a deep brown eye shadow or you're not sure on which one to chose for neutrals, I'll definitely say to get this shade!